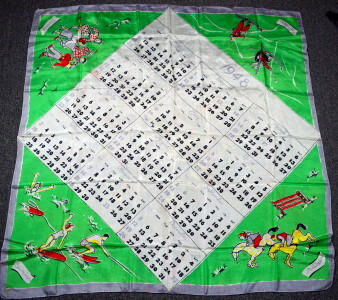 1940's vintage 1948 calendar motif square scarf. Off white, apple green and red, yellow and light gray silk. Season activities motif: spring, summer, autumn and winter. Rolled hems. All original 40's vintage. Perfect momento with a 1948 connection. Fair condition, as found. Could benefit from professional dry cleaning. Shows general soil & color run marks throughout. Some wear and pinholes throughout. Not perfect, but totally wearable. Price reflects condition.